U.S. President Donald Trump met with Chinese Vice Premier Liu He in the Oval Office on Thursday. Chinese Ambassador to India Luo Zhaohui released an article in Indian media entitled Dragon-Elephant Tango Creating the Asian Century Thursday on the occasion of the 69th anniversary of the establishment of diplomatic relations between China and India. 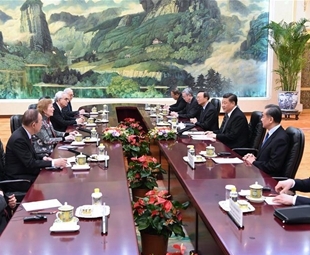 Chinese President Xi Jinping said in a message delivered to his U.S. counterpart, Donald Trump, on Thursday that new substantial progress has been made on the text of the China-U.S. economic and trade agreement in the past more than one month. Chinese President Xi Jinping said in a message delivered to his U.S. counterpart, Donald Trump, on Thursday that a healthy and stable development of China-U.S. relations needs, in particular, their strategic leadership. Chinese State Councilor and Foreign Minister Wang Yi on Friday met with Cambodian King Norodom Sihamoni and Queen Mother Norodom Monineath Sihanouk, and Princess Maha Chakri Sirindhorn of Thailand respectively in Beijing. 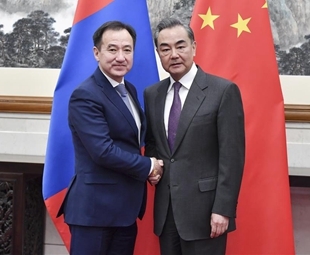 Chinese State Councilor and Foreign Minister Wang Yi held talks with Mongolian Foreign Minister Damdin Tsogtbaatar in Beijing Tuesday. 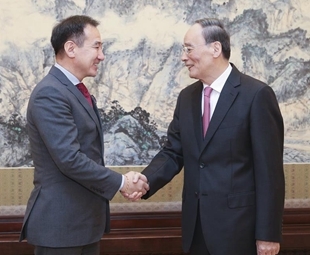 Vice President Wang Qishan met with Mongolian Foreign Minister Damdin Tsogtbaatar in Beijing on Monday, saying China hopes for the continuous development of the two countries' comprehensive strategic partnership. Ahead of New Zealand's Prime Minister Jacinda Ardern’s upcoming visit to China, Wang Jiarui, chairman of China Soong Ching Ling Foundation (CSCLF), led a delegation to New Zealand to deepen ties between China and New Zealand.